Make firm dough adding a little water at a time. Knead it well.Keep aside for 20 minutes, covered with a moist cloth and then knead again. Turn heat to medium and cook till the meat is tender and all the water is absorbed. The filling should be dry. let it cool completely. Mix 1 tsp. flour with 2 tbs. water, to make a ‘glue’. Keep it aside. Divide the dough into 10-12 portions and make balls, using greased hands. Keep covered with a moist muslin/cloth. Glue the overlapping edges and press gently to give a good seal. Fill the cone with approximately 2 tbs. of the meat mix. You should have enough edge left at the top to get a good seal. Using the ‘glue’, press and seal the edges together. Heat the oil in a pan on medium heat. Test by putting a small piece of dough into it, it should sizzle and rise to the top quickly, but the oil shouldn’t be smoking. Put as many samosa as will spread out easily in your pan and fry gently to golden brown. If you fry too fast, the samosa cover will not be crisp. Note : For people who want a healthier version, instead of deep frying them, you can bake them in the oven. 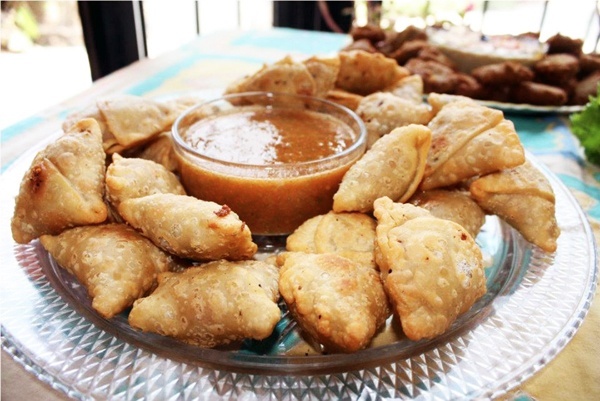 Place the samosas on a baking tray and put in the centre of the oven. Bake for 25-30 minutes, turning them once halfway through cooking until lightly browned. This entry was posted in All Recipes, Chicken, Snacks & Appetizers and tagged keema samosas by Kamakshi. Bookmark the permalink.